Steve Saxon, owner of Sacramento, Calif.-based Affordable Moving &Storage, has sued Nevada, claiming the Silver State isn’t as business-friendly as it claims. Saxon seeks to overturn the law governing how Nevada grants business licenses for moving companies, limousine services and other transportation-related businesses, The Sacramento Bee reported. The lawsuit, filed in mid-February in U.S. District Court in Las Vegas, said Nevada denies licenses to companies that pose a threat to existing businesses. Beyond Saxon’s lawsuit, Nevada officials are mired in controversy over licensing ride-sharing company Uber, which brought protests from Las Vegas taxi operators. According to the Bee, Nevada officials wouldn’t comment on Saxon’s lawsuit but said the Nevada Transportation Authority, which oversees licensing, rejected only 11 of the 324 applications it received since 2009 from transportation companies. Affordable Moving, which recently merged with a Reno-based limousine service, was denied permission to expand its fleet last summer. Both companies are being represented by the Pacific Legal Foundation, which specializes in conservative causes. Timothy Sandefur, the Pacific Legal Foundation’s principal attorney, said approximately two dozen states still have comparable laws to Nevada, but the Silver State’s law is the roughest. Going from controversy to cereal, Las-Vegas based Umpqua Oats Inc. began offering its single-serve oatmeal cups in even more grocery stores across the country. 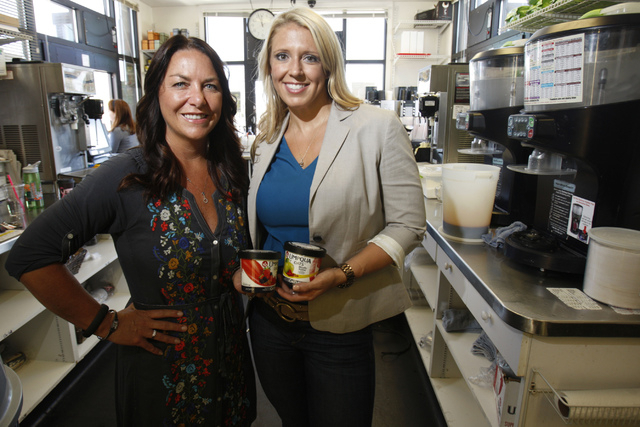 Owners Sheri Price and Mandy Holborow moved to Nevada from Oregon in July to take advantage of the Silver State’s business-friendly environment. The company was featured in the Business Press last fall. Last month, the company expanded the reach of their single-serve oatmeal cups, which are now available in Albertsons stores throughout the Pacific Northwest and in Northern California Raley’s stores. The oatmeal is offered in more than 230 new retail locations, expanding Umpqua Oats’ grocery presence to more than 3,000 stores. “Since launching grocery distribution in early 2014, we’ve been thrilled with the response from retailers,” Price said in a statement. The oatmeal is also sold throughout California, the Pacific Northwest and the Southwest at BiMart, Bartells, Fred Meyer, Kroger, QFC and Save Mart stores. SiriusXM is launching “Startup School Radio,” a weekly show broadcast live from San Francisco that offers listeners insights and advice from tech startup founders and success-focused investors. The show, hosted by Y Combinator partner Aaron Harris, launches at 10 a.m. Pacific time March 11, exclusively on SiriusXM’s Business Radio. “Startup School Radio” also will offer SiriusXM listeners insight on how deeply motivated entrepreneurs got their starts and overcame challenges, along with tips on finding seed money, making connections and dos and don’ts for launching products. “Startup School Radio” will air 10 a.m. Pacific time Wednesdays on Business Radio Powered by the Wharton School, channel 111.